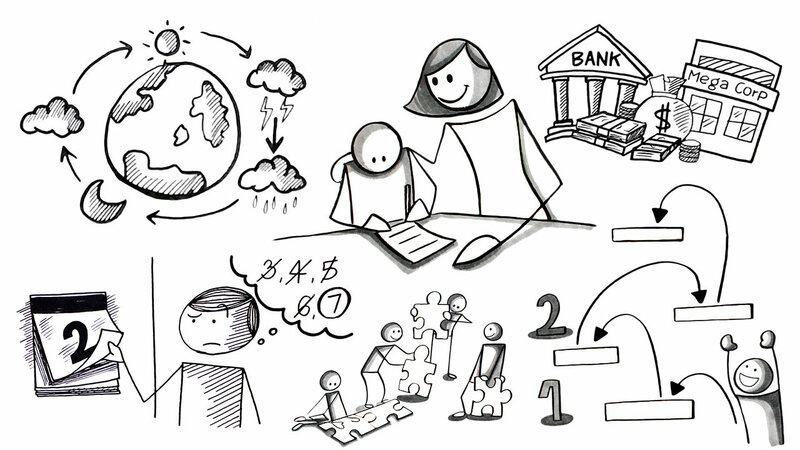 The base package is our most simple and affordable type of storyboarding. Compared to our other storyboarding styles we only use stick figures for people. Items are draw with much less detail and shading than our premium add-ons and we draw them in 2D instead of 3D whenever possible. Our stick figures are generally drawn with a box like body which makes it easier for us to draw and write things on them to show who they are, what they do and things like that. From the boxed body there’s 2 lines each for the legs and arms. The arms are connected to hands which also have a surface area. The head isn’t directly connected to the box that represents the body, instead it floats over it. The head should also be oversized to emphasise emotions and expressions. Here are some more examples of our stick figures.